Nowadays, advertising tends to get lost in the information noise. That’s why it’s difficult to overstate the importance of constant communication with customers. A well thought-out content marketing strategy is the best tool to build strong relationship with your target audience. Keep in mind, it’s most likely that your competitors have already devised their plan – you don’t want to fall behind, do you? Well, what to do if you have made a thorough research about the market but are still not sure how to apply this information in a practical way, i.e. to make your content marketing strategy work? Here are some useful hints exactly for this case. A modern content marketing strategy has to be based on actual information. This means that you have to consider a lot of external factors when planning the Ideal Message for advertising, websites, blog, etc. These factors may include market conditions, new competitors, changing customer demand, and, of course, their interests. It could be a new edition of some bestseller, a Marvel’s movie release, a football championship start, or other events they may be keeping track of. Planning content strategy in accordance with these important dates will greatly increase loyalty and trust of your customers. To build the content marketing plan that will resonate with your audience, you want to use the right tools. The most important thing in building your own content marketing strategy is setting the right goals. For clear understanding, it is more convenient to visualize them. There is no single way to do this, it just has to be an inspiration for you and your team to achieve the needed results. Moreover, it helps comprehend the strategic direction of the company. Of course, it would be cool to, say, have branded cups with your slogan and mission, but an inspiring desktop wallpaper and posters with your strategic plan around the office will do the trick too. It is not enough to think like your customers, you have to become your customer. Fall in love with your product and make your target audience feel for it the way you do. There is no better recipe for catchy content than to write it with passion. Actually, that’s why word of mouth works so effectively – it is the language of true emotions. So, write about your product or service with passion (but don’t overdo) and, chances are, your audience will be excited by it. The 70:20:10 formula by Coca-Cola can become a real insight for crafting your content. Put simply, it says that 70% of your content have to be habitual for customers. 20% – creative and risky, e.g. with new text presentation formats. The rest 10% should manifest your craziest ideas. As there is no one-size-fits-all formula for every business, this percentage is not a strong rule, of course. 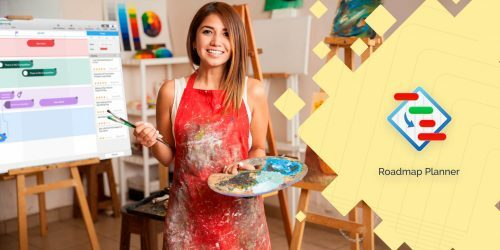 You can look at your content marketing strategy as a painter at the canvas. Like a masterpiece, your Message has to inspire the target audience to become your loyal customers. It’s okay if you are going to experiment with proportions. Don’t be afraid to try something new; this will help you to find the ratio that will be perfect for your business. As mentioned before, high-quality planning software is essential to make your strategy work like clockwork. And just like a professional painter, you should use the best brushes for your drawings. Instead of wasting much time on using inconvenient spreadsheets and sticky notes, try Roadmap Planner. Why exactly this app? First, it’s the simplest planner app in using. But there’s more to this. It has a variety of features which are crucial for this work. A user friendly interface will let you develop a strategy exactly the way you envision it. The Scopes and the Gantt Chart View will help you to visually organize your works. The Milestones will highlight the significant events. The Collaboration will keep your team up-to-date. Try it yourself!